This sleek, contemporary floor lamp is paired with a Beachcomb custom art shade for a stylish look. The base of this floor lamp has a modern look that pairs well with the unique personality of a giclee art shade. The custom made-to-order shade features a stylish Beachcomb giclee-printed pattern that is based on original Shibori-style dyed fabric and printed by the same technique used in reproducing museum-quality artwork. The base features a cool, brushed nickel finish and has an on/off pull chain. Shade printing process U.S. Patent # 7,347,593. 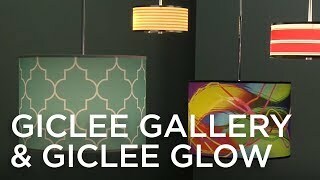 From the Giclee Glow brand of floor lamps. Custom printed translucent shade with Beachcomb blue pattern. Brushed nickel finish base. Metal construction. Been looking for something both my husband & I both liked. He wanted something with color. I wanted a more contemporary look. Hopefully, the quality will be good enough.